There is no doubt that the 'R' litter did give rise to good character, good backs, correct shoulder assembly and rich black and gold coloration. 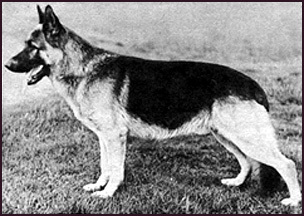 At the same time hind angulation, though less extreme than in some later dogs, was adequate with good width of thigh. On the debit side heads, though strong and masculine, tended towards coarseness in some females and occasionally had rather domed skulls and loose lips. Cryptorchid problems increased following in breeding on this line but more important was the tendency towards rather longer bodies than was desirable and with it a tendency towards rather heavy middle pieces and some shortening of forelegs." "...the R litter dogs were not for sale at any price, they were being held on to for future use. They did have a tendency to produce a very course, straight reared type of dog. There was also a lot of looseness sometimes in the front end but excellent working character with strong jaws. One son of Rolf that was sent to the States, Lesko aus Kattenstroth SchH 111, was not widely used."